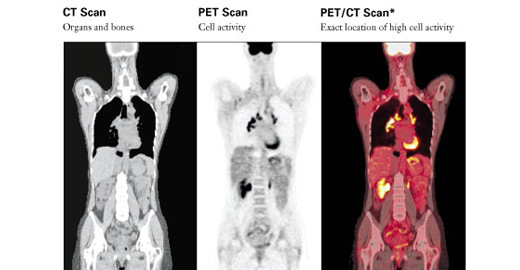 A PET/CT scan is a combination of a PET (positron emission tomography) scan and a CT (computed tomography) scan. The PET scan involves the injection of a radioactive tracer that is absorbed into the body proportional to activity injected and is what the camera acquires images of. The tracer gives us a measure of metabolic activity (physiological function) throughout the body, with overactive areas appearing brighter on the pictures. The CT scan uses x-rays to create a detailed view of the anatomical structure of the body. It also allows us to measure how much energy from the tracer is being absorbed by the body, leading to much more accurate PET images. Combining the PET and CT exams lets us marry physiology and anatomy to create an incredibly detailed and informative study to be used by your doctors. What should I expect from the test? After checking in, you will be brought in to receive a small injection of a radioactive tracer called F-18 fluorodeoxyglucose (abbreviated FDG), which is essentially sugar water. There are no side effects to the injection whatsoever. We then bring you to a relaxation room, where you can recline and read, watch television, or take a nap for approximately one hour. Afterwards, we encourage you to use the restroom (as it helps the quality of the images) before we start taking pictures. The exam takes 15-35 minutes (depending on patient height and the nature of the test). After the test you will have no restrictions of any kind.